The Conosa is one of three subphyla in the Amoebozoa. It is subdivided into two infraphyla – the Mycetozoa and the Archamoebae. Mycetozoa: a group of slime moulds. Archamoebae: distinguishing mark: they have no mitochondria. 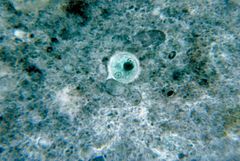 Conosa includes the species Dictyostelium discoideum and Entamoeba histolytica, among others. About 2000 species are known, and probably there are many more. Because these cells have few visible characteristics, they do look rather alike: "they exhibit few morphological traits that can be used as taxonomic characters". As their molecular biology becomes known, many species may get split. ↑ Cavalier-Smith T 1998. "A revised six-kingdom system of life". Biol Rev Camb Philos Soc 73 (3): 203–66. doi:10.1111/j.1469-185X.1998.tb00030.x. PMID 9809012. http://www3.interscience.wiley.com/resolve/openurl?genre=article&sid=nlm:pubmed&issn=1464-7931&date=1998&volume=73&issue=3&spage=203. ↑ 2.0 2.1 Bapteste E; Brinkmann H. & Lee J.A. 2002. "The analysis of 100 genes supports the grouping of three highly divergent amoebae: Dictyostelium, Entamoeba, and Mastigamoeba". Proc. Natl. Acad. Sci. U.S.A. 99 (3): 1414–9. doi:10.1073/pnas.032662799. PMC 122205. PMID 11830664. http://www.pnas.org/cgi/pmidlookup?view=long&pmid=11830664. ↑ Song J; Xu Q. & Olsen R. 2005. "Comparing the Dictyostelium and Entamoeba genomes reveals an ancient split in the Conosa lineage". PLoS Comput. Biol. 1 (7): e71. doi:10.1371/journal.pcbi.0010071. PMC 1314882. PMID 16362072. http://dx.plos.org/10.1371/journal.pcbi.0010071. This page was last changed on 23 February 2016, at 12:03.